The Finnish Independence Day was first celebrated on December 6th 1917, after Finland declared itself an independent nation in the context of the Russian revolution, and it’s status as an autonomous grand duchy of the Russian Empire came to an end. Gaining independence was the result of sisu and long-term efforts of Finns. As Finland celebrates 100 years of independence this year, the most notable year of our generation, it is clearly a big and very special year for us. The anniversary year 2017 is a chance for all Finns and friends of Finland to get together. Tens of thousands of events and gatherings will be organized around Finland under the name Finland 100. The celebrations also reach beyond Finland’s borders; the big year is celebrated in several countries. Finland100NYC is an official Suomi100 project that celebrates this significant year in New York City throughout 2017 with various events. The year 2017 marks the 100th anniversary of Finland’s independence, with world-wide celebrations. 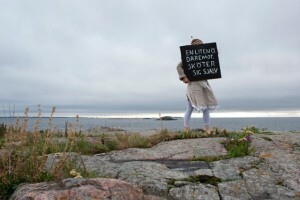 Finland Center Foundation is proud to present the exhibit by Victoria Schultz: ON A SUMMER ISLAND IN THE GULF OF FINLAND; part of Finland 100NYC events in New York this fall. ©2011 Victoria Scultz, all rights reserved. “In August of 2011, I spent a week on Klovharu, a tiny island in the outer archipelago that dots the southern coastline of Finland. The cottage Jansson had built there is now an artist’s residence. While on Klovharu I read THE SUMMER BOOK for the first time. It reminded me of my own childhood summers on another remote island in the Gulf of Finland. With colored chalk I found in Jansson’s cabin I wrote snippets from the book on the bare cliffs. Then I photographed ‘staged but true’ moments with the feel of wind and sea and craggy rocks all around”, says Ms. Schultz. 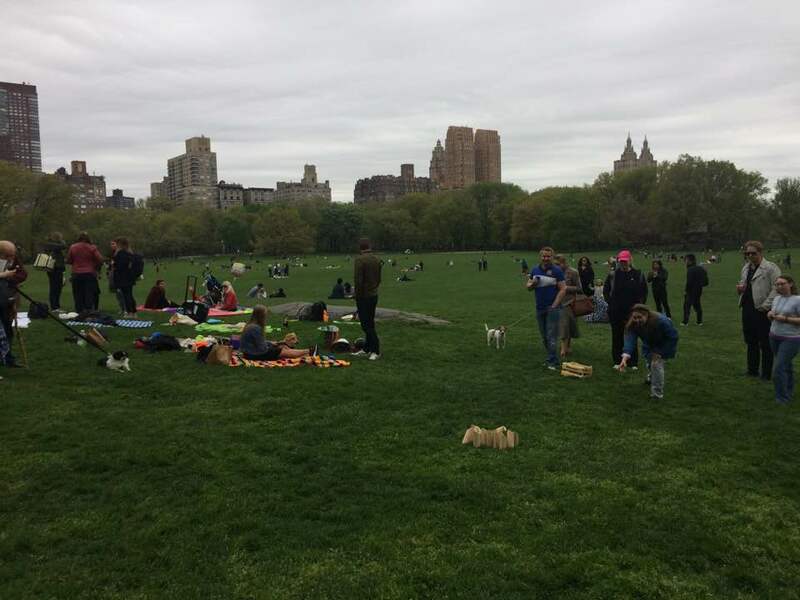 FCF organized a traditional Vappu Picnic in Central Park. We had such a great time with all of you who came to celebrate Vappu (the 1st of May or May Day). Jukka Pihlman won the mölkky, congratulations! Thanks to all the participants! Something incredible is happening in Japan: the women are living longer and healthier than anywhere else on Earth. They are eating some of the world’s most delicious food yet they have the lowest obesity in the developed world by far. Dojo restaurant in Greenwich Village became the scene of a Japan-Finland friendship event on March 5, 2017. Naomi Moriyama, the co-author of three books on Japanese cuisine, explained to us the secrets of Japanese home cooking. The talk was followed by a delicious Japanese meal! Naomi Moriyama demystified Japanese home cooking and explained how easy it is for you to enjoy it right away! Naomi spent six months in 2015 in Joensuu, Finland, where her husband William Doyle was a Fulbright Scholar, and will sprinkle her talk with some of her impressions on the North Karelian cuisine. She is a Manhattan mom and author of “Secrets of the World’s Healthiest Children: Why Japanese children have the longest, healthiest lives – and how yours can too” published by Little Brown in UK in 2015 and Amazon Kindle in the US in 2017, “Japanese Women Don’t Get Old or Fat: Secrets of My Mother’s Tokyo Kitchen” (Random House US, UK, and 20 other countries), which was hailed by The Washington Post as a "delicious way to stay healthy”, triggered a UK sequel “The Japan Diet” and was a Wall Street Journal Best New Year Diet Book. She has been a judge on The Food Network’s acclaimed IRON CHEF AMERICA TV program, and a guest on the US’s top rating TV shows including The Today Show, The View, and Dr. Oz. Prior to writing the books, Naomi served as Chief Marketing Consultant for Ralph Lauren Japan, as director of marketing at HBO in New York, and as account executive at Grey Advertising in Tokyo and New York, working on the Procter & Gamble and Kraft General Foods accounts, and as independent US-Japan marketing consultant, serving multi-national corporations. She grew up in Tokyo and on her grandparent’s farm in rural Japan. Naomi lives in New York City with her nine-year-old son and her husband and co-author William Doyle.